All Praise is due to Allāh, we praise Him, seek His aid and His Forgiveness. We seek refuge in Allāh from the evils of our souls and the evils of our actions. Whomsoever Allāh guides there is none to misguide and whomsoever Allāh misguides there is none to guide. I bear witness that there is none worthy of worship except Allāh, alone, without any partners and I bear witness that Muhammad (صلّ الله عليه و سلّم) is His servant and Messenger. The truest speech is the Book of Allāh, and the best way is the way of Muhammad (صلّ الله عليه و سلّم). The worst of affairs are the newly invented matters, every newly invented matter is an innovation, every innovation is misguidance, and every misguidance is in the Fire. This is because ibādah (worship) does not benefit an individual whilst shirk (polytheism) is present. So, whilst a person is committing shirk, even if he worships Allah, that worship of Allah does not benefit him because he has associated partners with Allah (ﷻ) in worship. It is a must that a person abandons the worship of everything besides Allah (ﷻ) in all of its forms, in all of its types, in all of its categories and in all of its names. Shirk or polytheism is defined as, ‘directing anything from the worship that is the sole right of Allah (ﷻ) to other than him’. So these are the conditions that will bring about the salvation, peace, security, aid and establishment upon the earth. And it begins with the rectification of the ‘Aqeedah (the belief and creed) and the rectification of one’s deeds. Without these two affairs, i.e. without the rectification of one’s belief, and without the rectification and correction of one’s actions, then the Ummah will continue to be humiliated and it will be in a state of constant torment. This is something that we can see presently before us, daily. We can see how catastrophes and afflictions have already befallen those who have violated these conditions stated by Allah, and that causes distress to the whole Ummah. Allah has made clear that those who believe, work righteous deeds, worship Allah alone and do not commit shirk, He will give them establishment, security and peace (Surah Al-Noor 24:55). Likewise, He will aid those who aid His religion, and when Allah establishes them in the earth, they perform the prayer, pay the zakat, enjoin the good, and forbid the evil (Surah Al-Hajj: 41). So, if the people desire the aid of Allah and want Allah (ﷻ) to give them glory, happiness, salvation, peace, security, abundance and establishment in the earth, then look towards these core elements and conditions. By acting upon them, Allah’s aid and support will come. Tawheed it is taken from the word or the verb wahhada, which is to make something one or singular, i.e. to make something one, without a second or a third. Wāhid is something that is one and singular, is the opposite of two, the opposite of three and opposite of more than that. One is that which is independent, something single not shared by anyone else or anything else. As it relates to the Shari’ah, i.e. the religion of Islam then Tawheed is, ‘To single out Allah alone with worship’ (ifrādullāhi bil-ibādah). So, to single out Allah alone with worship is to make Him the sole One to whom all worship and devotion are directed. Allah (ﷺ) has stated in Surat al-Anfal (8:39) “..so that the religion, all of it, is for Allah” The religion means all of one’s worship, all of one’s deeds and all of one’s devotion must be directed towards Allah (ﷺ) alone. So this is the meaning of at-Tawheed in the Shari’ah, ‘to single out Allah with the worship and to abandon the worship of everything besides Him.’ Anything besides Allah (ﷻ), the worship of it, devotion to it, servitude of it, prostrating to it, supplicating to it, seeking aid from it and seeking refuge with it – all of it is forbidden because all of these affairs are the sole right of Allah (ﷻ). 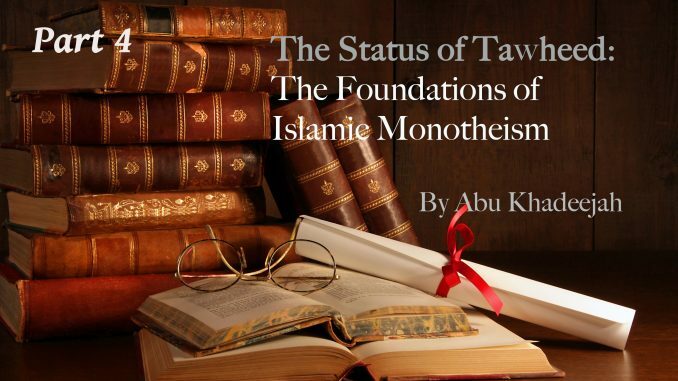 Let us now move on to the categories of Tawheed (Monotheism). Tawheed is of three categories that are established clearly in the Book of Allah, the Mighty and Majestic. This division of Tawheed into three categories was not derived from anyone’s thought or opinion, and it is not considered to be mere terminology. Rather, this categorisation is taken from the Book and Allah, it is established in the Book of Allah (ﷻ). So one should not consider these categories of Tawheed to be something superfluous, something that a person does not consider, or just someone’s opinion. No, rather, the Qur’an mentions these three categories over and over again – and there is no fourth, fifth or sixth category. Whenever Allah (ﷻ) speaks in the Qur’an of Tawheed, it falls into one of these three categories and no more. The first of these categories is Tawheed Ar-Rubūbiyyah, which is the Tawheed of Allah’s Lordship. Its definition is, ‘to single out Allah alone with His actions‘. This is the Tawheed of Allah’s Lordship, to single Him out with actions that are unique and particular to Allah, such as creation, provision, giving of life, causing death, and controlling the affairs of the creation. All of these are from the actions of Allah that are specific to Allah. A person must believe that Allah is the creator and creates from nothing as He wills, the one who sends down the rain, the one who brings out the crops from the earth, gives life, causes death and so on. This is Allah (ﷻ), and that is the first category of at-Tawheed. As for the second category, then it is to single out Allah as the sole Deity worthy of worship (Tawheed Al-Ulūhiyyah), to single out Allah alone in His worship (Tawheed Al-Ibādah) and these two refer to the same category. It is to single out Allah (ﷻ) alone with the actions of the servant. Meaning that the servant himself directs all of his actions to Allah. This is different to the first category, because the first category was to single out Allah alone with His actions. The second category is that the servant singles out his deeds making them sincerely for Allah’s sake. So these are deeds with which one comes closer to Allah (ﷻ) such as du’ā (supplication), khawf (fear), rajā (hope), rahbah (dread), raghbah (desire), tawakkul (trust and reliance), al-istiqāmah (to be upright), istighāthah (to seek deliverance and rescue), adh-dhadh (to slaughter or sacrifice), al-nadhr (to take vows), salāh (prayer), sujūd (bowing in prostration), rukū’ (bowing), and other than that from that acts of worship. Who is the one who does these deeds? The servant does them, the human being does them. All of them must be directed to Allah otherwise one has violated Tawheed. These are the actions of the servant that he does for none other than Allah (ﷻ). So, it is obligatory that worship, in all of its forms, is done solely for Allah the Most Perfect, that no aspect of that is to be directed towards other than Allah. And this is Tawheed Al-‘Ibādah, sometimes referred to as Tawheed Al-Ulūhiyyah. Tawheed Al-‘Ibādah, meaning singling out Allah alone with worship. Tawheed al-Ulūhiyyah is to make Allah (ﷻ) the sole Deity of your worship, the only God that is to be worshipped. Note: This is what is referred to also in some of the terminologies of the scholars as Tawheed Al-‘Amali (to single out one’s acts of devotion and worship for Allah alone), or Tawheed Al–Qasd (intending one’s deeds of worship for Allah alone), and it is sometimes referred to as Tawheed At-Tā’ah (to single out Allah in obedient worship). To be continued, inshā’ Allāh. Lessons from the Noble Qur’an by Shaykh Salih al-Fawzan (adapted).